Okay I finally tried another Pinterest recipe, so I can actually post the ingredients and instructions today. I made this on one of the weeks when I really didn’t feel like cooking anything. I hadn’t cooked a real meal for a few days and I was feeling bad for my fiancé so I turned to Pinterest for a basic chicken recipe. I was lucky to find this recipe already on one of my Pinterest boards because I already had all of the ingredients at home so I wouldn’t need to make a stop at the grocery store (thank GOD!). Baked chicken doesn’t really excite my taste buds like a juicy steak would so that makes me less excited about cooking it, but this recipe actually surprised me. It didn’t taste like regular baked chicken. It was more fun to make and more fun to eat. 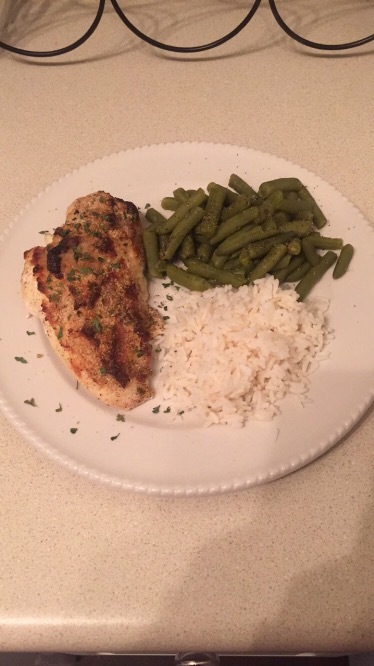 I just served it with white rice and some canned green beans that I’ve been trying to get rid of for a while (I want to use fresh or frozen veggies only). 4 boneless skinless chicken breast cutlets. I LOVE tuna. Tuna out of the can, tuna sandwiches, tuna helper, etc. I just love it. This recipe is a godsend because it puts together some of my favorite things to eat. Tuna, tomatoes, bread, and melted cheese! I’ve never been a huge fan of grilled cheese sandwiches because I don’t like toasted bread (I like my bread soft). But I can deal with the hard bread for this recipe. And quite honestly, I think it would be hard to eat this if you didn’t toast it because it could just fall apart. I’m telling you… you NEED this cookbook. Let me start by saying that I NEVER cook breakfast. My fiancé is way better at making breakfast foods than I am so I usually just let him handle that. 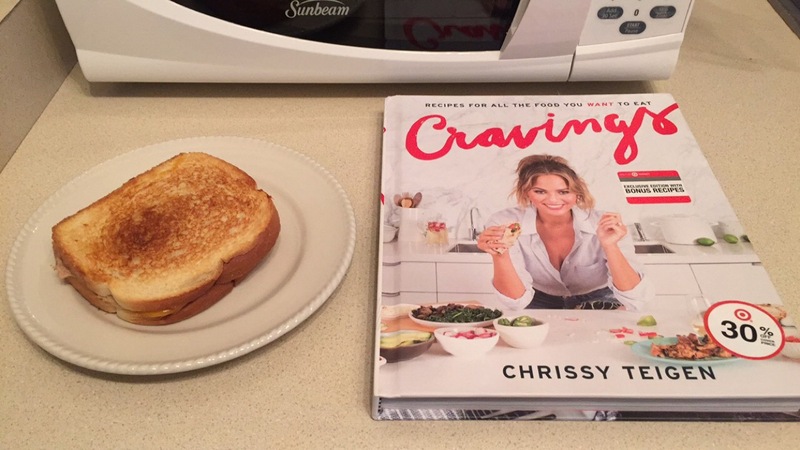 But when I found these two recipes in Chrissy Teigen’s Cravings cookbook, I figured that I would give it a shot. 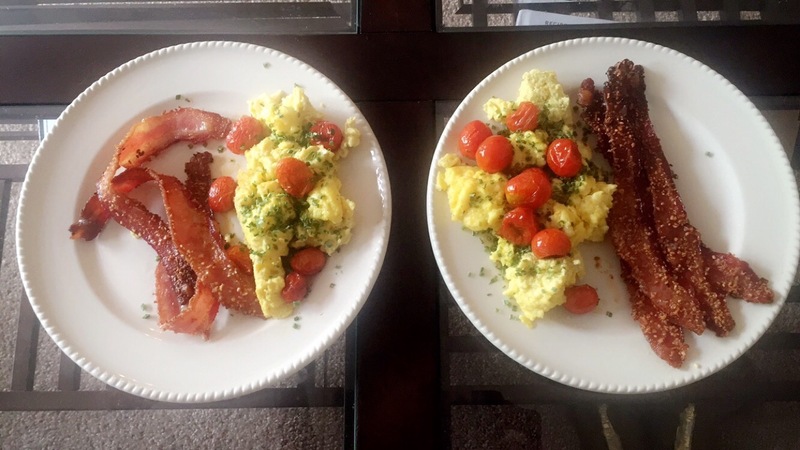 Our typical breakfast meal is eggs and bacon anyway so I can’t mess it up too bad, right? Let me just say, I would’ve never thought to add cherry tomatoes to my breakfast but they added such a burst of flavor. I love tomatoes anyway, but they are really amazing when they are warm/hot. This particular recipe uses a lot of eggs (twelve, to be exact). For my fiancé and me, it was way more than we actually needed. Now I have an extra plate of eggs in my fridge (which means I’ll probably have breakfast for dinner tonight). This cookbook is seriously amazing. I have not made one dish from this book that I didn’t absolutely love. Also, Chrissy’s commentary is hilarious and spot on. 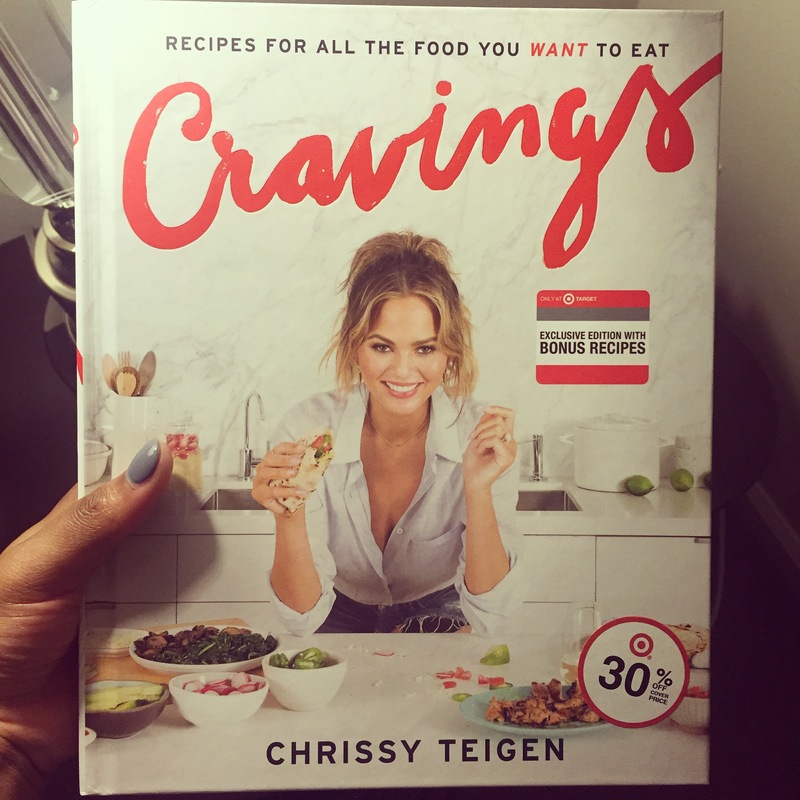 The other night I tried making a recipe from Chrissy Teigen’s Cravings cookbook. 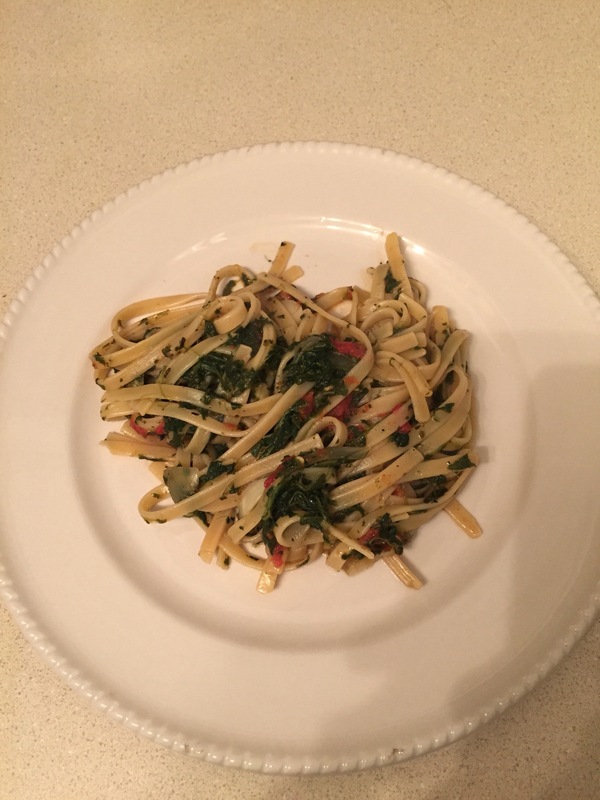 I made a few adjustments to the recipe and the directions. During our last trip to the grocery store, my fiancé picked up a huge slab of fresh salmon. It was so big that I couldn’t possibly use the whole slab for just one dinner for the two of us that night. So I had my fiancé cut the slab in half and freeze one half of it. 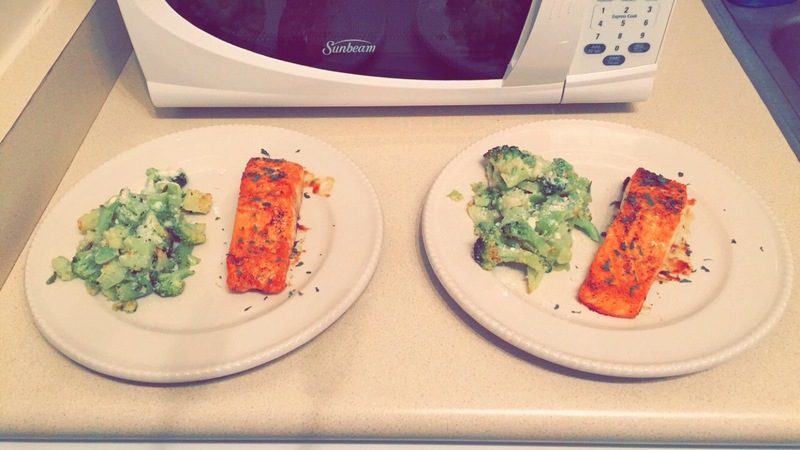 The first night we had the salmon and asparagus recipe that I posted about a few months ago. About a week later, I decided to use the other half of the salmon because I just didn’t like the idea of the salmon being frozen for too long. 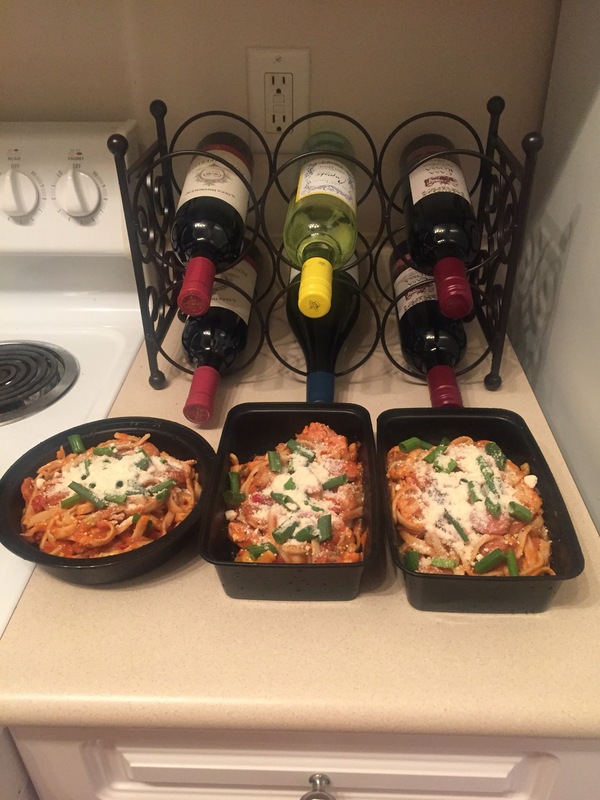 My fiancé did not want the same salmon recipe that I had made the week before because he had been eating the leftovers from that dinner at work for a few days. So I found another recipe on my Pinterest board that I had only made once and paired it with a new way to make broccoli. My mom used to boil broccoli all the time when I was still living with my parents. Sometimes we would have it two or three times a week. It’s kind of a running joke in that household. But I had a bag of frozen broccoli that needed to be used in my freezer, however I decided to try something new with it so that it wouldn’t feel as redundant. Another day, another one-pan recipe. Well…not exactly. You really need a large pan/skillet and a large pot, but it all ends up in one pan by the time you’re finished cooking. First, let me say that I am not a big fan of canned Alfredo sauce. It’s too much like mayonnaise in taste, look and smell. And I don’t particularly care for it when it’s heated up the next day. Generally speaking, it’s just not my thing. 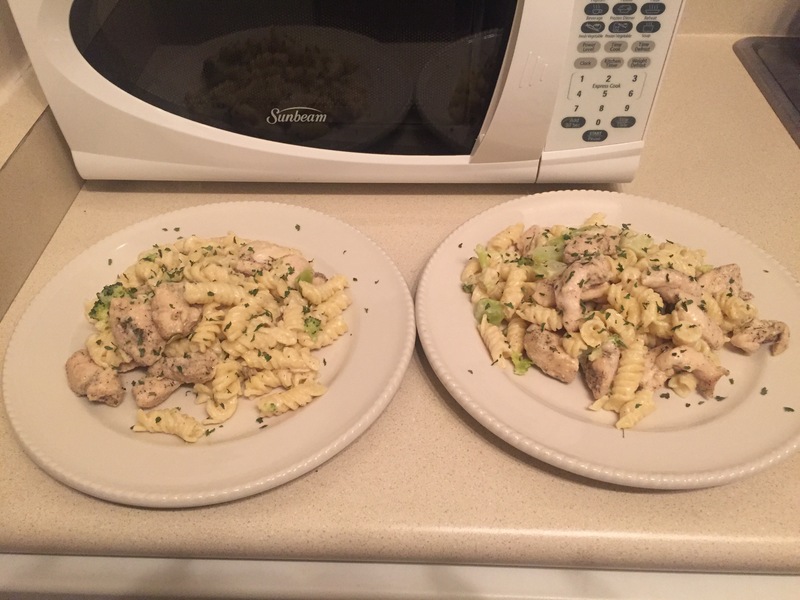 So initially when I found this recipe, I figured I would just have to take an L on this recipe and make something that I don’t really like because I know my fiancé would eat it and at the very least, it’d be something different for my taste buds. I was very surprised to find that this particular recipe with the word “Alfredo” in the title did not actually use any type of canned Alfredo sauce. Instead the recipe calls for heavy cream, milk and flour. It tasted so good! Instead of looking, tasting and smelling like mayonnaise, it’s more subtle and so much better. You can honestly barely see the sauce once the chicken, pasta and broccoli are mixed in. It’s very light but you can certainly taste it. Anyone who feels like they don’t like Alfredo sauce should probably try this recipe. More than likely, if you don’t like Alfredo sauce, you’ve probably just been using/eating a sauce that was too heavy. Click HERE to see the ingredients and instructions for this recipe. I tried a new one-pot recipe last week and the results were… pretty good. The recipe is called Spicy Cajun Pasta. It’s one of those recipes where you throw everything into a big stockpot and 30-45 minutes later, you’re done cooking. So it’s very easy to prep and it doesn’t leave you with a bunch of dishes to wash afterwards. The food came out looking and tasting great, especially when topped with Parmesan cheese. I personally felt like there was too much meat in it though. Even my fiancé agreed and he damn near throws a fit when I make a dish that doesn’t include enough meat. This recipe includes chicken, andouille sausage and shrimp. Out of the three, the chicken is the most useless as you can barely taste it. So if I were to make this dish again, I would only include the sausage and shrimp. Click HERE for the ingredients and instructions. Out of all of the new things that I’ve cooked this year, this so-called “Italian Wonderpot” is definitely in the running for my number one favorite dish. I was really proud of myself with this one. Although it was incredibly easy to make since it only required me to slice a few onions and garlic cloves, it’s hands down one of the best tasting outcomes that I’ve had this year. 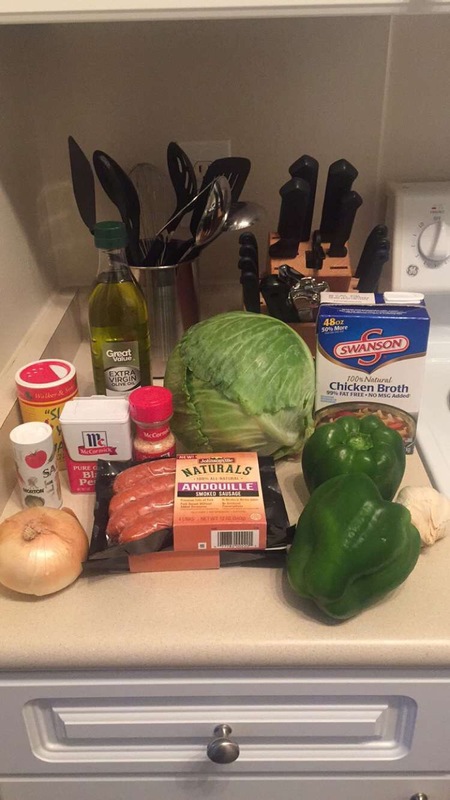 All you have to do is put all of the ingredients into a stockpot and stir occasionally. You’ll definitely have leftovers for a few days, but these leftovers taste great! It’s like the spices really seep in after it’s had some time to sit. One notable thing about this recipe is that it does not have any meat in it. This is something that my fiancé was kind of worried about (he can’t imagine a dinner meal without any type of meat), but he LOVED it. You definitely won’t feel like the recipe is missing anything even without the meat. But you can always add some diced chicken breasts if you want to add something new. After I’ve made this recipe as is a few times, I’ll probably try adding chicken just to see how it turns out.